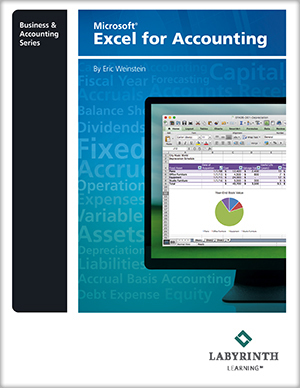 The ideal blend of accounting principle coverage and detailed, step-by-step instruction for Microsoft Excel. Our unique solution offers a sequential progression of material for both accounting and Excel topics, while simultaneously offering a variety of exercises that allow students to perfect their skills. Students are also taught how to apply their newly acquired Excel skills when solving real-world accounting problems. [Educators Only] Review the complete book in PDF today! Create an account or log in to view a PDF file of the prepublication edition (log in then click See Inside on the book image or Online Book Review on the Resources tab). With brand new content and our proven instructional design, making the switch to new materials is worth the effort! For a quick overview you can download a preview package that includes a full Table of Contents, an overview sheet with pricing, and a sample chapter (no log in required). Watch a recorded WEBINAR by author Eric Weinstein giving you a detailed overview of this new title. 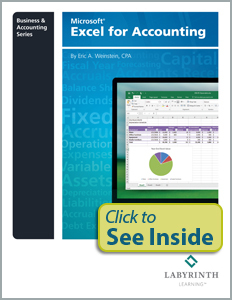 Accounting Refresher: Each chapter applies the Excel skills being taught to a specific accounting principle that's featured in the Accounting Refresher section toward the beginning of each chapter. Discussions are reminders (or "refreshers") of topics students likely learned in an Accounting 1 or Accounting 2 course. Real-World Accounting Application: The ability to apply what has been learned to a real-world scenario is critical to student success. Located just before the end-of-chapter content, the Real-World Accounting Application sections help students understand how the Excel skills covered can be applied to solve real-world accounting problems. Logical Sequencing of Content: Accounting principles are presented logically, progressing from basic to advanced. Excel topics are introduced with the accounting principle to which they are most relevant and also progress from basic to advanced. Flexible Approach: Chapters can be taught in sequence or as standalone lessons. Detailed Step-by-Step Instruction: Our time-tested method for teaching hands-on computer applications, developed over the past 25 years, is highly effective. Concepts are practiced after being introduced using detailed, step-by-step instruction. Exercise Progression Leads to Mastery of Skills: Students move through a series of end-of-chapter exercises that allows them to practice and then apply their new skills to real-world accounting scenarios, leading to deeper understanding and skill mastery. Labyrinth eLab provides a Build Your Course option and a Ready to Go Course option, where tests and assignments are already set up for you. Tests and quizzes in eLab are automatically graded and provide instant feedback to the student. An eLab license key is included with the textbook at no additional cost to the student. Our student and instructor resources are carefully created to enhance student learning and make course preparation easier for educators.